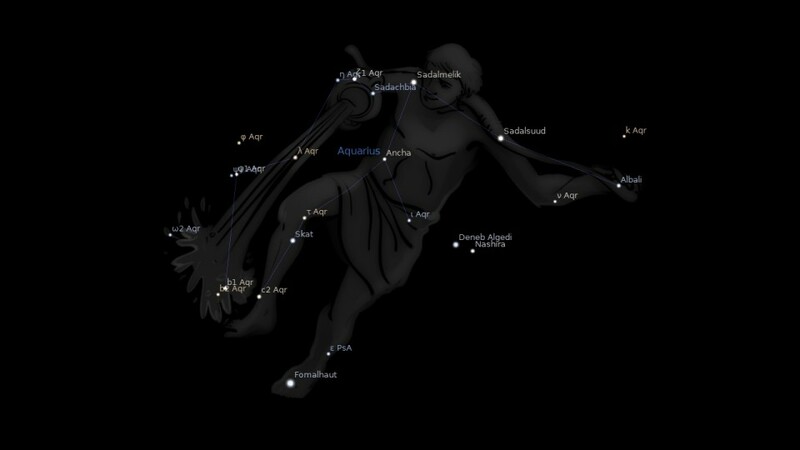 Aquarius constellation, the Water Bearer, is an ecliptic constellation laying between constellation Capricorn and constellation Pisces. It spans 30 degrees longitude in the zodiac signs Aquarius and Pisces. The Aquarius constellation contains 16 named fixed stars. Aquarius is said to represent Ganymedes, son of Callirhoe, the most beautiful of mortals, who was carried to heaven by an eagle to act as cupbearer to Jupiter. According to other accounts, however, it is Deucalion, son of Prometheus, who was translated to heaven in memory of the mighty deluge from which only he and Pyrrha were saved. 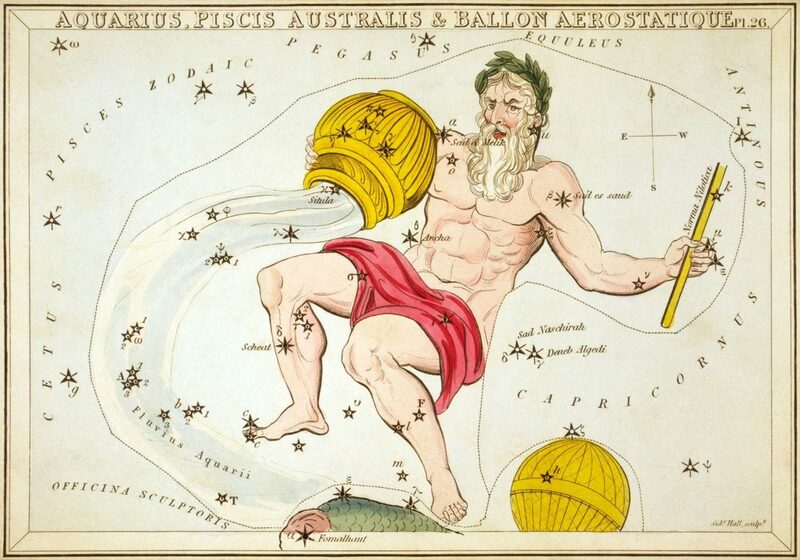 Aquarius, The Waterman…has universally borne this or kindred titles; Ideler assigning as a reason the fact that the sun passed through it during the rainy season. In connection with this the proximity of other analogous stellar forms is worthy of note: Capricornus, Cetus, Delphinus, Eridanus, Hydra, Pisces, and Piscis Australis, all the watery shapes in the early heavens, with Argo and Crater, are in this neighborhood; some of whose stars Aratos said “are called the Water”; indeed in Euphratean astronomy this region of the sky was ‘the Sea’, and thought to be under the control of Aquarius. With Capricorn it was the House of Saturn, governing the legs and ankles; and when on the horizon with the sun the weather was always rainy. When Saturn was here, he had man completely in his clutches — caput et collum; while Jupiter, when here, had humeros, pectus et pedes. As Junonis astrum it was a diurnal sign, Juno and Jove being its guardians, and bore rule over Cilicia and Tyre; later, over Arabia, Tatary, Denmark, Russia, Lower Sweden, Westphalia, Bremen, and Hamburg. Proctor’s Myths and Marvels of Astronomy has a list of the astrological colors of the zodiac signs attributing to Aquarius an aqueous blue; while Lucius Ampelius, of our 2d century, assigning in his Liber Memorialis the care of the various winds to the various signs, entrusts to this the guardianship of Eurus and Notus, which blew from the east, or southeast, and from the south. The Atonement being made, the blessings have been procured, and now they can be bestowed and poured forth upon the Redeemed. This is the truth, whether we think of Abel’s lamb, of patriarchal sacrifices, the offerings under the Law, or of that great Sacrifice of which they all testified. They all with one voice tell us that atonement made is the only foundation of blessing. This was pictured and foreshown in the heavens from the beginning, by a man pouring forth water from an urn which seems to have an inexhaustible supply, and which flows forth downwards into the mouth of a fish, which receives it and drinks it all up. In the ancient Zodiac of Denderah it is the same idea, though the man holds two urns, and the fish below seems to have come out of the urn. The man is called Hupei Tirion, which means the place of him coming down or poured forth. In some eastern Zodiacs the urn alone appears. 1. Fixed Stars and Constellations in Astrology, Vivian E. Robson, 1923, p.28-29. 2. Star Names: Their Lore and Meaning, Richard H. Allen, 1889, p.45-49. 4. The Witness of the Stars, E. W. Bullinger, 18. Aquarius (the Water Bearer). Gu-la ‘The Great One’ (Aquarius) actually represented Ea/Enki, the God of Water,Wisdom,and Magic. Gavin White discusses this in his book, Babylonian Star-lore: An Illustrated Guide to the Star-lore and Constellations of Ancient Babylonia. Astrological,Astronomical,and Mesopotamian sites have also noted it. Some sites do just mention only Greek Mythology’s Ganymede’s association with the constellation. Some do include Egyptian Mythology’s Hapy, God of the Nile River’s association with the constellations. The Babylonian’s associated many of the constellations with aquatic symbolism were closely associated with Ea who ruled over the watery region of the Heavens. Capricorn was another Zodiac constellation that was associated with Ea/Enki for the goat-fish was one of his symbols. It wasn’t just a goat. It was mythical aquatic creature. The healing goddess, Gula was very likely to have been the original deity associated with The Great One , and so there is truth to what Diana Rosenberg wrote. However, Gula was ultimately replaced by Ea/Enki long before the existence of the Mul.Apin which was a Babylonian compendium that deals with many diverse aspects of Babylonian astronomy and astrology. One astrological text states that the Great One is the Lord of Springs which was Ea/Enki. In ancient art, Enki/Ea is often depicted with vases with overflowing vases in his hands or set around his throne dais. He is also shown to be seated within a square which is thought to represent the Abyss. Ea/Enki dwelled in the Apsu, the watery region located between the earth and the netherworld as part of the 7-tiered Mesopotamian Cosmos which are the basis of the ziggurats.There are entitlement stones of Ea/Enki as the Great One. By the start of 2nd millennium B.C., The Great One was depicted as a standing man holding and overflowing vase. For a thorough history,meaning and symbolism of Aquarius, you can’t just discuss Great One’s link with Gu-la and leave out Great One’s link with Ea/Enki for a thorough meaning of Aquarius. Enki, was a deity that represented healing, fertility, and creation. Rosenberg equated the deity, Oannes with Ea in her book and on her website. I have also seen this at sacred texts site. There has been a theory that Oannes was a form or another name for Ea. It is now thought that the name is the Greek form of the Babylonian Uanna, an Apkallu which are seven part-man, part fish seven demi-gods associated with human wisdom. Understanding the Ea/Enki aquatic roots of Aquarius is important. I have a very strong Aquarius Constellation influence myself, and so it’s no surprise that I am into Astrology. Moon conjunct Sadalmelik (alpha Aquarii) and Ancha (theta Aquarii) in Ecliptic Longitude.